Aitzaz Ahsan says Arif Alvi is Pakistan’s ninth President. Is he right? On the day of the presidential election, Barrister Aitzaz Ahsan said that it was the ninth election and not the 13th. He wanted to say that his party doesn’t recognise the four presidents who came into power after imposing martial law. 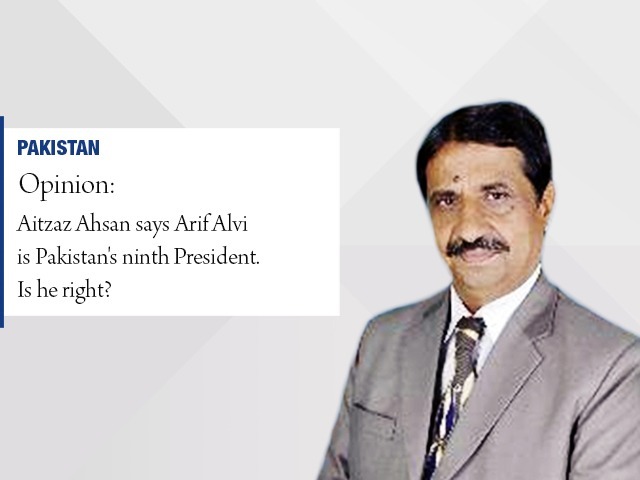 The democrats must have liked his remarks and constitutionally Ahsan was right. Zulfikar Ali Bhutto, the founder of the PPP, was part of General Ayub Khan’s cabinet when he ousted President Iskandar Mirza and imposed martial law in 1958. Bhutto was very close to General Ayub and considered himself his heir. He was given the post of general secretary in his Convention League. Bhutto was appointed General Ayub’s chief election agent in the 1965 presidential election in which he defeated Fatima Jinnah through rigging. How could Ahsan disown his party’s past? Bhutto started calling General Ayub a dictator days after he was removed from his cabinet. In 1991, after Benazir Bhutto’s first government was dismissed, she said in an interview that one of the reasons for her ouster from the office was the misogynistic mentality of Pakistani men. She said that men can’t tolerate a woman ruling the country. She said that Quaid-e-Azam’s sister was also defeated through this mindset. Nobody asked her about Bhutto’s role in General Ayub’s victory. Can Bhutto’s heirs deny that he was made the deputy prime minister and foreign minister in General Yahya Khan’s cabinet just a few days before the fall of Dhaka? If Bhutto didn’t accept General Yahya as his president then why was he an important part of his cabinet? The PPP had a bitter relationship with third military dictator, General Ziaul Haq, but no one can deny that the PPP’s own president Chaudhry Fazl Illahi remained the president for a year during Zia’s regime. It may be noted here that Ahsan was sacked from the PPP in Zia’s era and he was part of Asghar Khan’s Tehreek-e-Istaqlal. The PPP had publicly accused Asghar Khan of writing an open letter to soldiers and incited them to overthrow an elected government. Asghar Khan was very close to General Zia. People used to say he would become the prime minister with the support of the army. In 2008, the PPP’s prime minister and ministers were administered oath by the fourth military dictator, General Pervez Musharraf. If all military dictators were unconstitutional presidents then Bhutto too was an unconstitutional president because he used the same way to become the first chief martial law administrator. Ahsan should keep his formula of presidential election but he needs to revisit the count. There were five, not four, unelected presidents and that makes Dr Arif Alvi the eighth president of the country.